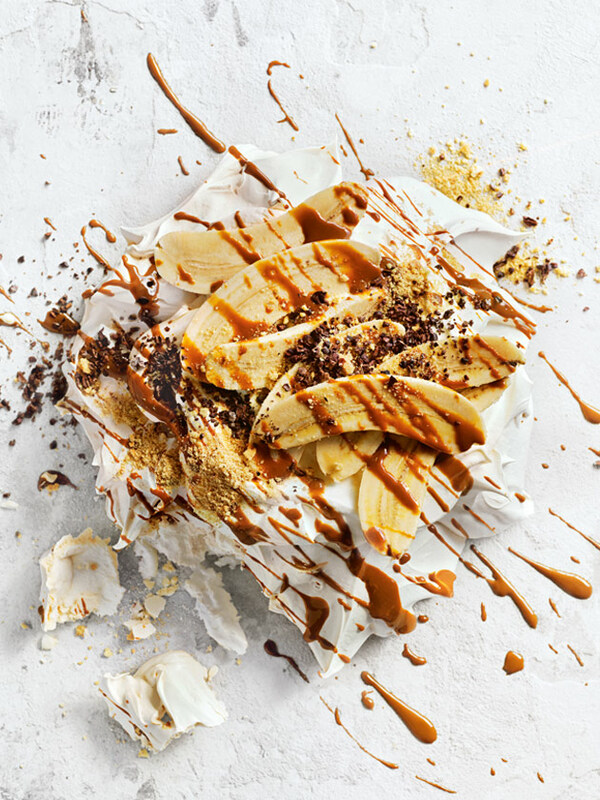 While the pavlova is cooling, make the banana caramel. Place the water and sugar in a small saucepan over low heat and stir until the sugar is dissolved. Increase the heat to medium and cook, without stirring, for 8–10 minutes or until dark golden. While the caramel is cooking, place the banana, vanilla and cream in a small jug and blend, using a hand-held stick blender, until smooth. Remove the caramel from the heat, add the banana mixture and stir to combine. Return to the heat and cook, stirring, for a further 1 minute. Set aside to cool completely. + Find cacao nibs at health food stores and some supermarkets. You could use finely grated dark chocolate in their place.